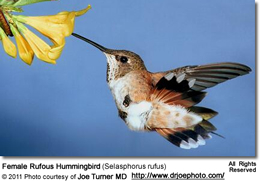 The following hummingbird species are known to occur in Illinois. 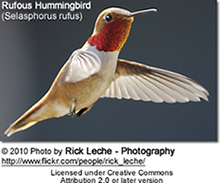 Ruby-throated Hummingbirds, Archilochus colubris - Native Breeders ... Generally arrive in April and are usually gone after the end of September. Males are usually the ones to arrive first to stake out their feeding territories, and to depart first. Females and juveniles follow about two weeks later. 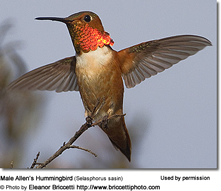 Broad-billed Hummingbirds (Cynanthus latirostris) - Accidental / Vagrants - These mostly Mexican hummingbirds venture into the United States regularly; they mostly visit the southern parts - but a few vagrants travel as far north as Wisconsin. 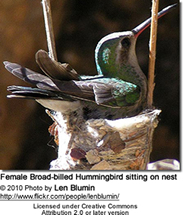 Most likely occurrence would be between July and December near hummingbird bird feeders. 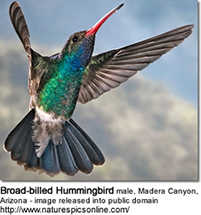 Black-chinned Hummingbirds are rare visitors in this state. 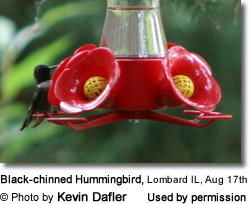 Lombard, IL: Kevin Dafler photographed a black chinned hummingbird at their feeder on Aug 17th, 2014. Peoria, IL in 2013 (regular visitor to bird feeder). 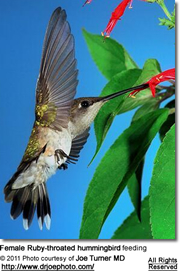 One male Black-chinned Hummer - reported by Kathy Haa to have visited her Lantana plant in Oswego, Illinois several times on 8/10/2013. 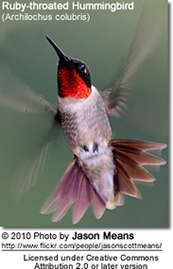 She described this Black-Chinned Hummingbird as appearing healthy with a beautiful plumage. It appears that the Black-chinned hummingbirds are expanding their territories into Illinois.